My first real "rabbit hole" into fountain pen collecting was the serendipitous purchase of an Esterbrook that had an 8668 palladium-silver nib attached. I have a background as a chemist and have long been in love with palladium; that coupled with the WWII history (another interest of mine) made this a fantastic discovery for me. It writes just beautifully! The first thing I did, being new to the game (and I still am!) was to look for advertising about these nibs and Esterbrooks in general during WWII. 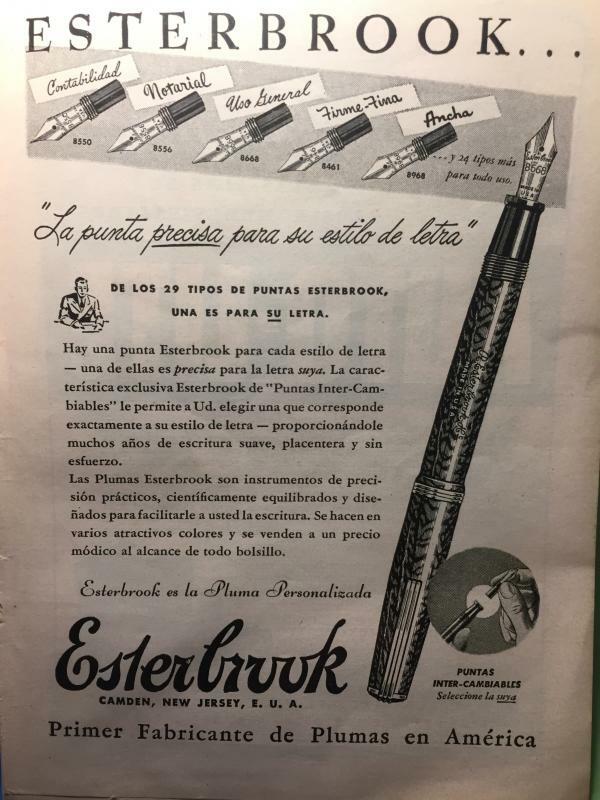 I loved finding ads stating that "only a few pens can be made" due to the war effort, and, "If your stationer cannot supply you immediately with Esterbrook Pens we know you will understand why." Just amazing stuff, and a wonderful look into one aspect of WWII American culture viewed through the lens of a fountain pen lover. I wondered if the 8000-series nibs ever showed up in advertising, and I had not been able to find any such ads until recently. I thought the other Esterbrook fans here might enjoy a look at this Argentinian ad I found that shows the 8000 series... I wonder if anyone else knows of 8000 series Esterbrook nibs showing up in ads or being mentioned in period literature? My understanding from readings in the world of Pelikans is that palladium-silver nibs were a war time reaction to the scarcity of gold. As a complete novice in Esterbrook pens --- although an owner and user of a few--- I did not realize Esterbrook offered gold nibs. Did they? I have only steel ones in my stable with the 9968 nib being a personal favorite. In some countries (like Japan, for example) gold was considered a critical war resource. Germany may have been one (Pelikan), but the US was not. Here, steel was considered to be one though, so steel nibs became very rare. Esterbrook never made gold nibs as far as I know - certainly not in Renew-Point models. Maybe before that. Brian Anderson would know, and if they ever made 14k nibs, his Esterbrook site will say so. Thanks for showing us! What do you love about palladium? Sheaffer continued making PdAg nibs well after the war. 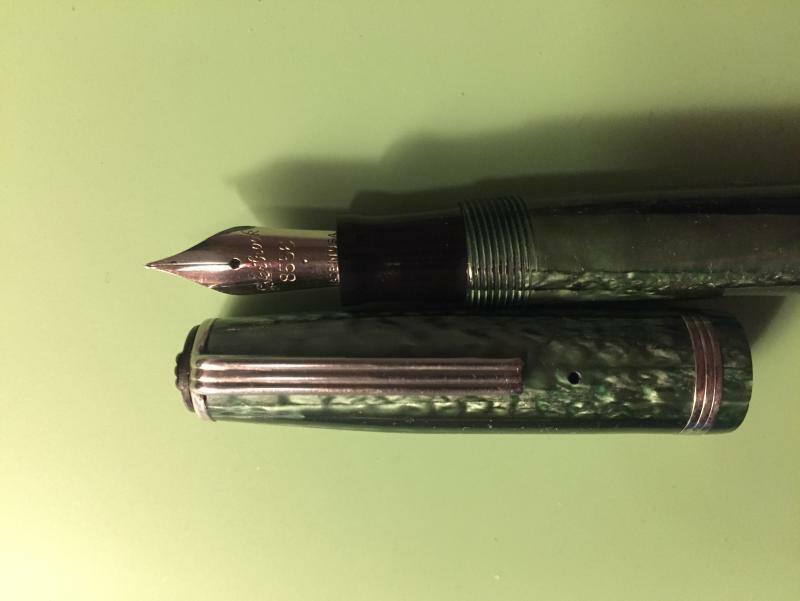 For example, I have a Skripsert 500 from 1957 or a little after (I don't know when they stopped making them) with a PdAg sheath nib. Maybe it was a more "upscale" option that was still cheaper than gold. Thanks Tweel -- I do also have a couple Sheaffer'S with palladium nibs -- one a snorkel that says "Palladium Silver" in lovely script on the nib (their silver-colored nibs that say simply "Sheaffer's" are also palladium as far as I know) and a PFM II that I had to have because it has "PdAg" on the nib, which to a chemist like myself is completely irresistable. Palladium is just a beautiful bright white noble metal that only recently became regarded as "precious," and more and more jewelry is being made of it (like mine and my partner's engagement rings). I have an advanced degree in organic chemistry and used palladium in a few of the key reactions in some of my syntheses. The chemistry of which it's capable, as well as its beauty on a macro scale, are just so appealing to me on lots of levels. This is also something I find so interesting, EMQG, that steel was needed enough to replace it with palladium and silver! I also do not know of any Esterbrook nibs containing gold, except for that darned gorgeous 8440 mapmaker's needle-sharp nib that is gold-plated in part but, I presume, palladium/silver like the rest of the 8000 series. I have heard also that some of the Esterbrook furniture (also steel I believe, and therefore "non-brassable" and still beautiful after much wear!) may have been replaced with palladium around WWII -- does anyone know this to be true? Woah, you're the guy who bought my PFM II on ebay, aren't you? Just a couple weeks ago? Small world, huh? No idea if they replaced their trim with palladium. I've never heard that before, I but I don't know everything. Sure am! Small world indeed -- wrote two letters just tonight with it! I did not realize Esterbrook offered gold nibs. Did they? I have only steel ones in my stable with the 9968 nib being a personal favorite. As far as I know, Esterbrook didn't make any gold renew-point nibs, but did make gold nibs for their Relief pens. Great choice on the 9968. It's a favorite of mine as well! Esterbrook did make some 14ct Renew-points, but only in England, so really not part of this discussion in that manner. Some transitionals (not very common) and all twistfillers will feature palladium trim. The 8000 series were referred to as the "Palladar Series" by the way. I have an original box that would have housed 12 renew-points. It was blue, for those keeping track of which colors they used. Amazing, Brian, thanks! Henceforth I will totally call my 8000 series nibs "Palladar." I was able to find one vintage ad in the Des Moines Register from Dec 1943 but am not motivated to pay to view it just now... I wonder if other ads mention these nibs? Very cool to see the old ads. Palladar! I think that's worthy of being a battle cry. It sounds very swords and dragon-y. "The Knights of Palladar guarded the sacred realm for a thousand years before the desolation of the Great Wurms of Venus put an end to their vigil." "By the power of Palladar!" "Great Palladar, what in Terra?" 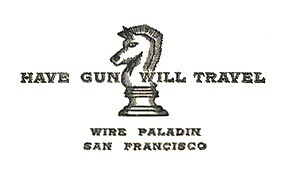 Reminds me of the old TV western series, "Have Gun, Will Travel" *(circa 1957); the hero being a gunslinger-for-hire who called himself Palladin. I remember watching that and Gunsmoke on Friday nights.